NEWPORT, RI (May 26, 2018) – Manuka Sports Event Management announced today the sixth edition of the Atlantic Cup. The longest offshore race in the Western Atlantic dedicated to the Class40 will start from Charleston, South Carolina one year from today on May 26, 2018 and culminate the weekend of June 10th in Portland, Maine. In addition, 11th Hour Racing, Bainbridge International, and Hyatt Place Portland are returning as sponsors for the 2018 race. With over 1,000nm of ocean racing, the Atlantic Cup is the longest offshore race in the Western Atlantic, the only race that includes both Cape Hatteras and Cape Cod and the only short-handed offshore race dedicated to the Class 40. The race was created in 2011 to showcase short-handed, offshore racing with hard fought competition and exciting shore based events, while also being the most environmentally sustainable sailing race in the United States. The Atlantic Cup has been carbon neutral since 2012 and was the first and is the only sports event in the U.S. to be ISO 20121 compliant. The 2018 Atlantic Cup will start in Charleston, South Carolina May 26th with a 648-nautical mile race to New York City. The race will stop-over in Brooklyn May 28th-June 2nd. Teams will race from New York 360-nautical miles to Portland, Maine. The Atlantic Cup will wrap up in Portland June 4th-10th with a two-day inshore series. Initial interest for the 2018 race is strong with six teams having confirmed entry with another four indicating interest. The Atlantic Cup is a 3-stage, double-handed offshore race that spans the eastern seaboard of the United States. At 1,008 nautical miles it is the longest offshore race in the Western Atlantic. In addition, the Atlantic Cup is the only race to go include rounding both Cape Hatteras and Cape Cod. 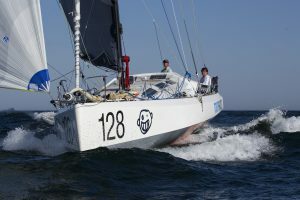 The race is sailed solely in Class40s, a monohull race boat designed for shorthanded racing. The Atlantic Cup ran annually in May from 2011 through 2014. After 2014, the race moved to a biennial event. As of 2016, the Atlantic Cup’s stop-overs include Charleston, S.C., Brooklyn, N.Y. and Portland, Maine.